The shared CW universe of DC Comics characters took a massive leap, with the introduction of not just a team of heroes, not just a group of villains forced to team up with said heroes, but an ensemble adventure through time to save the fate of the planet itself. And judging by the fan reception, the viewers of The Flash and Arrow are eager to see more from DC's Legends of Tomorrow. Of course, that doesn't mean those same fans got to enjoy everything that the premiere episode of Legends had to offer. As is usually the case, the launch of a DC Comics property on the small screen brings with it plenty of nods to the comic book source material, not to mention hints at future stories to get fans talking. Legends was no exception, so we thought it best to point out the episode's inside jokes and let even casual fans enjoy their handiwork. Enjoy our breakdown of the Legends of Tomorrow Premiere: 10 Easter Eggs You Missed. Before the time-hopping adventure even sets off, it's Rip Hunter (Arthur Darvill) who has to plead with the Council of Time Masters, asking for the opportunity to change time to prevent mankind's conquering at the hands of Vandal Savage. But in so doing, the council has their own concern: what if he makes things worse, instead? The warning can get fans wondering, but make sure you catch the actor who is delivering it: that's MacKenzie GRay, known to Superman fans for playing Alistair Krieg (who created Cyborg) and Lex Luthor's clone on Smallville, and the Kryptonian Jax-Ur in Man of Steel. When audiences are introduced to Jonas Hunter, Rip's son (although they don't know it at the time), they don't get much time before Vandal Savage (Casper Crump) takes his life, along with countless others. But before he departs, the boy lets it be known that his name is "Jonas." 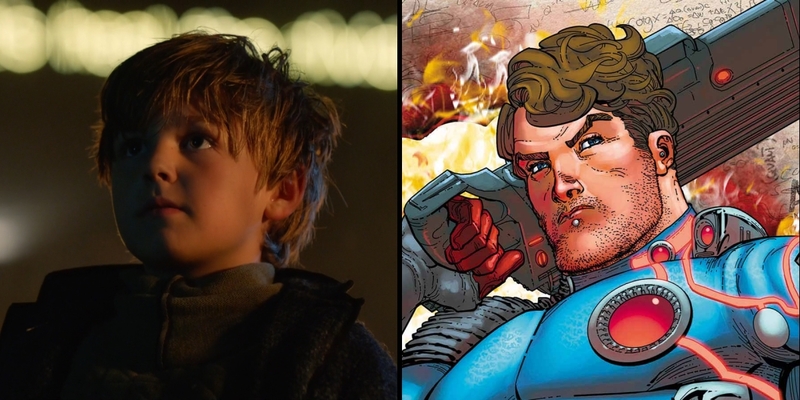 There's no son for Rip Hunter in the DC Comics universe (although it was recently revealed that Rip is himself the son of oddball hero Booster Gold), but the name should carry some significance for the producers behind the shared Arrow/Flash universe. Marc Guggenheim has recently created a futuristic genius hero of his own by the name of 'Jonas Quantum.' Considering the shared scientific experimentation between the two properties, it doesn't seem like coincidence. Less of an easter egg, and more of a strange parallel that fans of time travel in general will want to know about. When Arthur Darvill landed the part of 'Rip Hunter' on Legends, he was either an unknown, or unforgettable as Rory Williams, one of the beloved companions of the BBC's Doctor Who. And as more of the show's story became clear, the inside joke became famous. After serving a coat-wearing, rebellious Time Lord in a commandeered time travel device, Darvill would now be the one wearing the coat, bearing the Time Master rank, and traversing the timestream in a commandeered vessel of his own. A weird coincidence... or an intentional one? Given the ship's ability to ride back and forth through the timestream, seeing it called The Waverider makes plenty of sense. But the title is actually a reference to a DC Comics hero. In the comics, he began simply as Matthew Ryder, a man who, just like Rip Hunter, saw the rise of a powerful, tyrannical villain, and wished to stop his rule from ever happening. Assuming the villain began as a hero, he built a time machine with the hopes of finding out his true identity. But when the machine's powers were fused with his own body, he took the name Waverider, the hero capable of passing through time at will - now made famous on The CW (sort of). Considering the science fiction behind the rest of the show's premise, the reveal that it's an A.I. powering The Waverider isn't all that stunning. But the artifical intelligence's name is. No Flash fan will forget that 'Gideon' was also the name of Eobard Thawne's trusty A.I. with knowledge of the future, presumably alone and forgotten in the basement of S.T.A.R. Labs. So the potential explanation here is obvious, but the question now becomes: did Thawne acquire the A.I. directly from Rip Hunter, or do all artifical intelligence bear the exact same name in the future? We're open to any and all theories. The Egyptian story behind Hawkgirl and Hawkman was established fairly quickly during the recent crossover of The Flash and Arrow, making some significant changes to the comic book origin story (making the immortal Vandal Savage the one linked to their cycle of reincarnation). Although Kendra Saunders (Ciara Renée) constantly claims to be lacking some of her memories, it looks like her personal decor is trying to make up for the shortcomings. We don't know if having statues of Egyptian gods on your table is the best way to remind guests that you're really a reincarnated Egyptian mystic, but it's working for Kendra. St. Roch is introduced as just another fictional town in the DC Comics/CW universe, but its importance is known to the diehard fans of Legends' winged team members. The Louisiana (Terrebonne Parish, to be specific) town is famous as the home of Hawkman and Hawkgirl, who have been known to reside in a few lesser-known fictional cities in the comic publisher's version of the United States. Besides the Suicide Squad's home, Belle Reve prison being located nearby, it seems the moment of realization on Carter Hall's (Falk Hentschel) face when the city is referenced is meant for the fans, as much as his teammates. Once Rip Hunter and his team begin their mission, the audience learns that another armed time traveler is on their path: Chronos, a "temporal bounty hunter" sent to track down and bring in/kill Rip Hunter, presumably to preserve the timestream as it is. 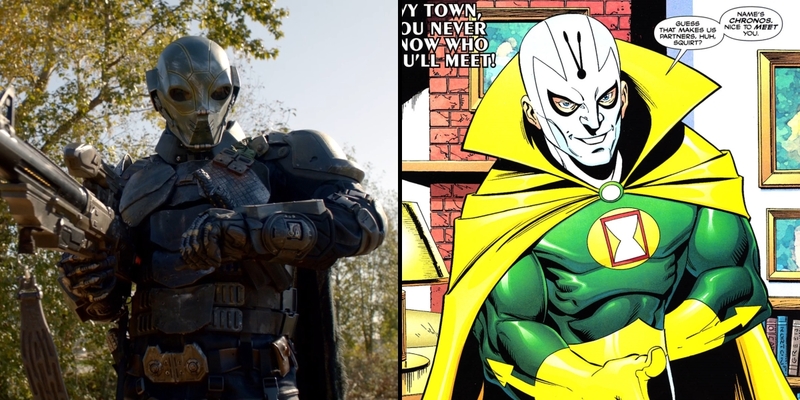 The costume may be pointed out for its resemblance to Star Wars characters, but the name is right from the comics. Sure, this version of Chronos is a bit more intimidating than the most famous comics version, who used his uncanny knack for timing and time-based gadgets and gags, but it's nice to see an easter egg that's as silly as it is unexpected. If this easter egg is anything to go by, then fans should make sure they're looking even harder for potential references to the world of the comics, and The CW in particular. When Kendra and Carter are learning about Vandal Savage, it isn't just their son-from-a-former-incarnation that they're sharing the scene with, but a poster promoting a guest feminist lecturer. The name "Virginia Millsap" isn't a famous one in feminist circles, but it is on the set, since Virginia Rose (also credited as Virginia Millsap) spends her time as a Vancouver-area production assistant, with both The Flash and Deadpool on her résumé. And apparently, has earned some fans in the prop and art department. We're willing to bet that Rip Hunter's quarters aboard The Waverider will be rich with easter eggs and well-hidden comic book knick knacks, but at least one can be spotted in the seconds spent inside the room. When Rip is grabbing his bag off his desk, pay attention to the top of a nearby cabinet: it may look like a metal pot with holes cut into the metal, but fans of DC's Golden Age recognize it as the head protection of the original Red Tornado. That isn't a reference to the Red Tornado famous to Justice League or Supergirl fans, as the crimson characters with power over the air, but Ma Hunkel, the first woman to take the name. Building a costume out of thermal underwear and a pot to become the kind of hero her son read about in comic books, Ma took to the streets of her own neighborhood to give criminals a lashing. Unsurprisingly, Rip - like all DC readers - can't help but appreciate her story. Those are the easter eggs, secrets and tiny touches we spotted in the premiere episode of Legends of Tomorrow, but which ones did we miss? Let us know in the comments, and we'll expand the list as more secrets are discovered. DC's Legends of Tomorrow airs Thursdays @8pm on The CW.